In long-term disaster settings, even prepared medics may end up using their entire supply of commercially-made medicines. As such, caregivers should consider the medicinal benefits of the plants in their own backyard as additional tools in the medical woodshed. Due to their longevity, essential oils are probably some of the best natural products the medic can stockpile. Producing them, however, requires knowledge, experience, and equipment. In addition, you’ll need a lot of plant material. It takes 250 pounds of lavender flowers to make 1 kilogram of essential oil, and that’s if you have the right variety, soil conditions, weather conditions, and other factors in place. In the long haul, a more realistic option for sustainable herbal medicines is using fresh or dried plant materials in teas. These require little more than a garden and some knowledge regarding each herb, the parts of the plant used, and the medicinal effect. It should be noted that the term “tea” is incorrect: The word actually refers to various drinks made from the leaves of one species, Camellia sinensis. Indeed, green, black, white, and oolong teas are made from the same plant; only the processing differs. The proper term for a drink made by steeping herbs in hot water would be an “herbal infusion” or “tisane“. For simplicity’s sake, though, we’ll call them teas. Standard teas from Camellia Sinensis, like green, black, white, and oolong, are high in antioxidants with many health benefits ascribed to them. These include heart disease, type 2 diabetes, liver dysfunction, and more. Bring some water to a roiling boil in a pot or other container. Crush leaves, flowers, and/or roots, depending on the plant. Pour the boiled water over 1 teaspoon of herbs and let steep for about five or ten minutes. Keep a cover on while steeping. Place a strainer over a cup and pour (alternatively, use a tea bag or “bob”). Use honey or lemon to add flavor if desired. A tea doesn’t always have to be ingested to be of benefit; some may be used as an eye wash, an irrigation solution for wounds, or in cold or warm compresses. Alfalfa: The seeds and leaves contain vitamins A, C, E, and K, as well as calcium, phosphorous, iron, and potassium. 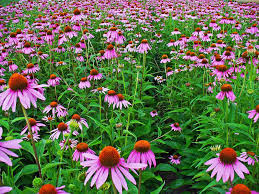 It has been used as a diuretic to help urine flow and for upset stomachs. There are claims that it helps arthritis pain and may lower cholesterol. Use 1 to 2 teaspoons of dried leaves, steeped in 1 cup of boiling water, for 10-20 minutes. Burdock: The dried root has been used in teas to help clear acne and to treat psoriasis. Use 2 tablespoons of fresh grated root or 1 tablespoon of well-dried root in 3 cups of boiling water. Catnip: Leaves and flowers are used to treat intestinal cramping, indigestion, diarrhea, and other stomach ailments. Also thought to treat respiratory infections like the common cold. A substance in catnip called nepetalactone is thought to produce a mild sedative effect. Use 1 teaspoon of dried leaves or 1 tablespoon of fresh leaves per cup. Chamomile: A favorite tea of many, it contains the amino acid Tryptophan, which gives it a sedative and relaxing effect. As such, it may help treat anxiety and insomnia. Antioxidants in chamomile may help slow down progression of visual, kidney, and nerve damage in diabetics. Â Use 2-3 teaspoons of dried flowers per cup. Chicory: When supplies of coffee ran out, soldiers in the Civil War used the root of this common plant as a substitute. It lacks caffeine, though, and has more of a sedative than stimulant effect in large amounts. Chicory root has an effect against intestinal worms, and has been shown in animal studies to improve calcium absorption and bone mineral density. Scrape the bark off the root before drying; use 1 teaspoon to 1 cup of water. Tea made from leaves has a laxative effect. Dandelion: You might be surprised to know that the common dandelion contains vitamins and minerals. Indeed, it’s thought to have more beta-carotene than a similar serving of carrots. 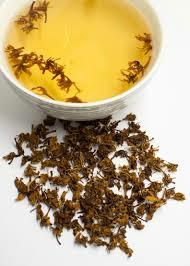 Young flowers and leaves make a good tea for constipation (steep for 20 minutes). Roasting the roots produces a coffee-like drink; use 2 teaspoons dried chopped root in 1 cup of water. Elder: Elderberry flowers make a tea that is used for many upper respiratory infections such as sinusitis, colds, flus, and laryngitis. Applied in a compress, the tea may be helpful for wound healing and some skin conditions. The blue or purple berries are high in antioxidants and may be made into a juice or syrup: Put two pounds of elderberries and four cups of water and bring to a boil, then simmer for a half hour. Use a fine mesh strainer to press out the juice. Sugar may be added under medium heat to make a syrup. Eucalyptus: Tea made from eucalyptus leaves offers relief from asthma as well as respiratory infections, mostly by opening airways and loosening thick mucus. It may have antibacterial and antiviral effects. Steep Â½ teaspoon of dried or fresh leaves in 1-2 cups of water. Ginger: The underground stems, or rhizomes, of Ginger are used to treat nausea of all types from morning sickness to motion sickness. Slice one inch of the rhizome into small pieces and simmer in two cups of water on low heat for 15 minutes. Then strain. Â¼ – Â½ teaspoon of ginger powder is another option. 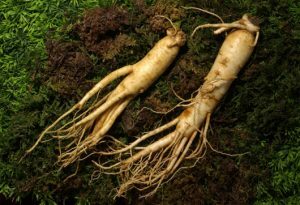 Ginseng: Both Asian and American Ginseng root can be made into herbal teas that are thought to lower blood sugar levels, a useful benefit for those with diabetes. Simmer three to six teaspoons of the root for 45 minutes in three or four cups of water, then strain. 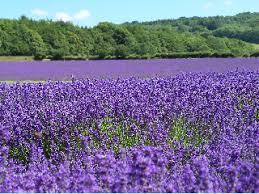 Lavender: Used in aromatherapy, lavender may improve nausea and other digestive symptoms when drunk as a tea. It’s thought to decrease migraine headaches and possibly limit convulsions and muscle spasms. 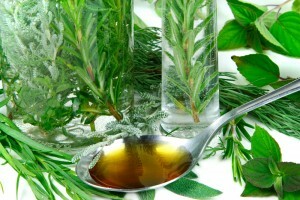 Use 1 tablespoon of dried herb in 1 cup of water. Lemon Balm: An herb with antiviral effects, it’s a member of the mint family. A tea made from lemon balm leaves and flowers was used in the past to treat mouth, throat, and dental infections like gingivitis and herpes sores. Also thought to decrease anxiety and aid sleep. Lemon balm may help improve intestinal spasms and nausea. 1 teaspoon of dried herb or 5-6 fresh leaves to one cup of boiling water makes a fine tea. Licorice: Better known as an ingredient in candy, its coating properties may help with sore throats, coughs, and heartburn. Licorice can, however, raise blood pressure and should be avoided during pregnancy. Add 1-2 teaspoons of chopped root to 2 cups of boiling water to make a decoction. Drink ½ cup at a time. Passionflower: Tea made from passionflower has a beneficial effect on anxiety and may serve as a sleep aid if taken regularly. Boil 1-2 teaspoons of herb (avoid the root) in 2 cups of water for 5-10 minutes. 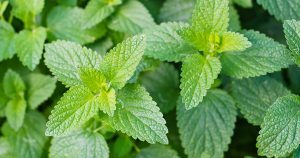 Peppermint: A long-standing herbal remedy, tea made from peppermint calms the stomach and helps Irritable Bowel Syndrome (IBS), but can worsen heartburn. The tea helps thin respiratory mucus and relieves nasal congestion. Put 1 teaspoon of dried herb or 6-8 fresh leaves over 1 cup of boiling water. Rose: Rose “hips” make a tea with vitamin C, as well as calcium, selenium, zinc, manganese, and others. It boosts the immune system and is thought to be beneficial for the adrenal gland, responsible for the stress hormone cortisol. Boil 1 teaspoon of dried rose hips in water and steep for 20 minutes. 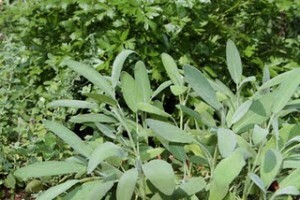 Sage: Sage leaf tea is a time-honored remedy for sore throat as well as the common cold as a tea or gargle. It may also aid digestion and decrease cramping, and may even improve memory. Steep 1 teaspoon of dried leaves in one cup of water. Stinging Nettle: Stinging nettle root is thought to have benefits as a diuretic to improve urine flow, even in those with enlarged prostates. The leaves may decrease the pain of arthritis in joints. Use 1 teaspoon dried leaves in 1 cup boiling water or boil 5 grams of dried root in 2 cups of water for 5-10 minutes. St. John’s Wort: One of the few herbs that has known activity against minor depression, leading it to be called “herbal Prozac”. Beware of interactions with prescription drugs, however. Pour 1 cup of boiling water over 1 teaspoon herb. Thyme: Teas made from thyme will loosen thick phlegm and may help coughs. It’s known to inhibit bacteria, viruses, and fungi, including many that cause respiratory infections. Steep 1 to 2 teaspoons of fresh or dried leaves in 1 cup of water. Turmeric: This herb contains curcumin, an anti-inflammatory compound that may treat Crohn’s disease and other digestive tract issues. As well, it may have beneficial effects on joint pain due to rheumatoid arthritis and other disorders. Valerian: The dried roots of this plant have been utilized for centuries to deal with anxiety and insomnia. 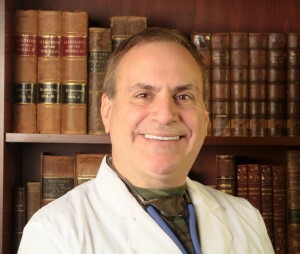 It may even decrease the frequency of seizures in patients with epilepsy. Its mild sedative effect eases pain and promotes sleep. Avoid alcohol or sedative drugs. Willow Bark: The green underbark of willow trees contain salicin, the original ingredient used to produce aspirin in the late 19th century. It is especially useful for muscle aches and joint pain. Simmer 1 teaspoon of bark in 1 cup of water for 10 minutes. There is much research to be done to scientifically confirm all of the effects of these plants, and there may be other benefits not mentioned or yet discovered. As well, many other plants have medicinal effects other than the ones in the list above; you might know of some yourself. The herbs above, however, are easily made into teas that can be produced even while on the move. 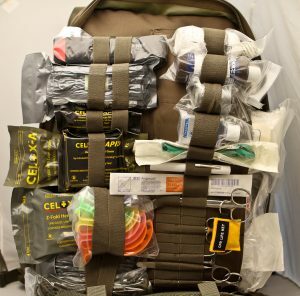 In any case, learning the use of natural substances for their medicinal benefits will make the off-grid medic an effective provider even in the most remote settings. Find out more about disasters (natural and man-made) with the 700 page Third Edition of the Survival Medicine Handbook: The Essential Guide for When Medical Help is Not on the Way. And don’t forget to fill those holes in your medical supplies by checking out Nurse Amy’s entire line of kits and supplies at store.doomandbloom.net.